Back in the 1990s, Victorinox has released a number of Collections, usually in groups of five, packaged in presentation boxes. Of all the collection series, the National Flag collection/series is the one which captured my attention. I think it is the fact that currently, it is hard to find all the pieces and it will keep my interest for a long time. 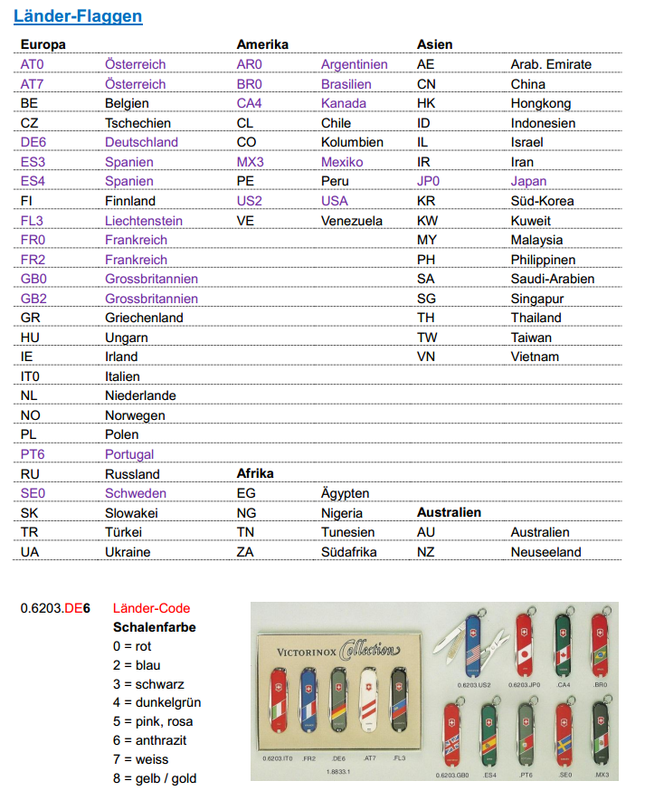 The original first collection: Flaggen der 5 Nachbarländer der Schweiz (1.8833.1) or the Flags of the Five Neighboring Countries of Switzerland was sold from 1995 to 2001. It consisted of flags from Italy, France, Germany, Austria and Liechtenstein. Together with the boxed collection, Victorinox also released the same series for a number of countries. Initially, only those country's flags indicating the shell color (indicated by the purple font on the image below) were produced. A minimum order quantity of 200 pieces was required to produce a model. Eventually, other countries were produced and even countries not included in the original list like Romania were released (albeit later). Although, I haven't seen all of the samples of the countries in the original list. Even the sakwiki page doesn't have the photos for each country. I have started collecting these small gems for a few months now and it's only two months ago that I got serious in acquiring them at a faster rate. I now have 10 countries -- 7 brand new ones, 1 in very good condition and 2 in ok condition. I hope to grow it more in the near future. I would love to get the flag from my adopted country - Australia and my native country - the Philippines and other South East Asian countries in the future. If you're reading my blog and you have one that you like to trade or sell, just leave a message. Thanks!